Intravenous Therapy (IV Therapy) is used to help rejuvenate the body by injecting essential vitamins, amino acids, and minerals directly into the bloodstream. Regardless of healthy diet, there are still areas of your health that can improve. Unfortunately, a healthy diet and even supplements are not enough to supply the body with the proper levels of the essential vitamins needed to avoid illness and remain at optimal health. At Mango Clinic, we offer a list of IV therapy, including: Myers Cocktail, Hangover IV Therapy, Cold and Flu IV Therapy, and IV Therapy for Weight Loss. 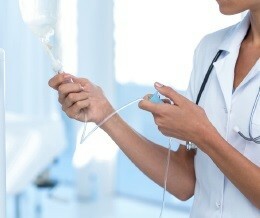 If you live in Miami, rest assured that IV Therapy is available to you. Call Mango Clinic in Miami to schedule a consultation today. To learn more about the Myer’s Cocktail IV Therapy, call Mango Clinic Miami to schedule an appointment for a consultation today. Hangovers are caused by dehydration from the use of alcohol. This is what doctors consider diuretic. Diuretic makes the body eliminate fluids through the process of creating urine. When the body reaches a certain level of dehydration, the symptoms of a hangover manifest. Hangover symptoms include dry mouth, fatigue, headache, nausea, and vomiting. Cold and flu IV Therapy is a mixture of supplements and vitamins that help to boost the immune system, so the body can effectively fight off viruses better. The supplements and vitamins included in this IV Therapy includes: high doses of Vitamin C, zinc, selenium, vitamins B1, B2, B5, B6 and B12, and a hydrating solution that can contain saline or Ringer’s Lactated Solution, depending on your health condition. Saline solution that is included in this IV Therapy is strictly composed of sodium chloride and water. IV Therapy for weight loss includes HCG injections (human chorionic gonadotropin injections), which are key in helping people maintain a BMI over 30. This is a great solution for people who have been unsuccessful using conventional weight loss methods. IV Therapy for weight loss is used to kick-start the body into increasing metabolism and eliminating fat cells. By making the body burn stored fat, a patient can keep the muscles lean without taking nutrition away from other cells. HCG is a hormone produced by pregnant women, and it is used worldwide for infertility in addition to weight loss support. HCG injections have been found to help burn fat while a person is on a low-calorie diet. Doing this can help a person reset their metabolism and increase weight loss. At Mango Clinic in Miami, we utilize HCG injections in combination with other treatments for weight loss. Each treatment program is customized to fit each patient’s individual needs. Call Mango Clinic in Miami to schedule an appointment for a consultation today. Whether you have an appointment or are a walk-in patient, our doctors are always available to help you with IV Therapy. Call us today to schedule an appointment.